Ducky Shincracker is the prototypical born and bred All-American musician. 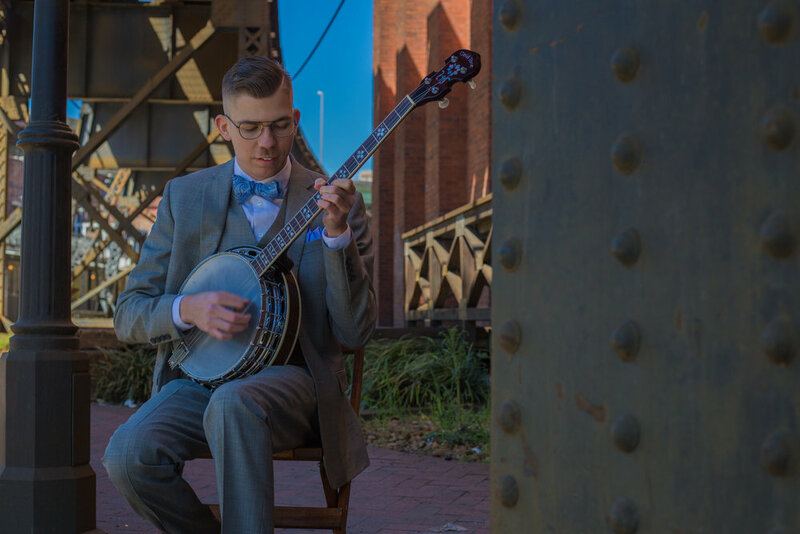 As a banjo player, and vocalist he is steeped in the traditions of musicians such as Eddie Peabody, and Louis Armstrong while simultaneously looking forward to contemporaries like Jim Kweskin, Bob Dylan, and Pokey LaFarge. Ducky's sound is broad and inclusive, combining elements of New Orleans, and Tin Pan Alley jazz, as well as Grand Ole Opry-era country, and Jug Band songs of the 1910s, and 20s. Whether you're a musician, dancer or just enjoying some time with friends and family, Ducky Shincracker has something for you. When Ducky Shincracker breaks out the boys in the Hotet all bets are off. Prepare to feel the gamut of emotions as we take you through sparse arrangements of deeply emotional gospel songs, and raunchy Depression-era blues as well as some of our biggest hits by artists such as The Preservation Hall Jazz Band, and The Del McCoury Band, as well as more modern groups such as Pokey LaFarge, and Tuba Skinny. We're equally adept, and just as comfortable providing "show quality" performances, as we are at providing music for cocktail hour or formal dinner. Please, feel free to contact us and we'd love to make your next event something special. Your favorite lounge band, John Anthony deftly leads a group of central Virginia's finest jazz musicians through renditions of tunes from the Great American Songbook, and jazz-styled arrangements of popular tunes of the 50s, 60s and 70s as well as blistering takes on songs made popular by musicians such as Joe Pass, Sonny Rollins, and Charlie Parker. We're happy to provide additional musicians to include: piano, drumset, saxophone and trumpet. This group has many years of experience performing at corporate events, company dining outs, as well as cocktail hours and weddings. We'd love to help you make your next event something truly remarkable.